These mechanical clocks contained electric motors, powered by dry cell batteries, that would wind the mainspring periodically. In addition, Western Union offered a subscription service that sent an hourly synchronizing signal over telegraph lines, and the clocks would react by moving the minute and second hands to 12. 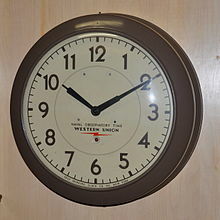 These clocks were commonplace at railway, radio, and TV stations. Not long ago I bought a similar looking battery operated wall clock. Lasts a year on a single Duracell AA. We had a couple of these at the University Heights (Bronx) studios of WNYU. We used the Western Union synchronization signal to generate an on-air time tone on the hour.